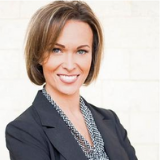 We’ve seen some solid successes with our WINPRO pups, new and old. Skeptics might say the changes we’ve seen are just a stroke of dumb luck, but we’re here to say: Luck’s got nothing to do with it. At the core of WINPRO pet supplements is our custom K-Thrive™ Formula D. This unique blend of spray dried blood proteins is the first of its kind and has been proved effective in over 300 clinical studies. These blood proteins contain highly beneficial nutritional components including IgG, IgA, serum, plasma, and albumin, making our WINPRO products safe, valuable, and completely all-natural. These components live, of course, in our own blood (and the blood of our pups!) already, too. By introducing a WINPRO regimen, you’revamping up your dog’s existing defenses against stress and inflammation, but doing it in a way that’s harmless and yummy for your dog. 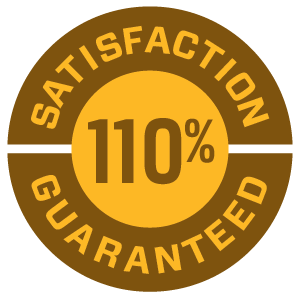 And don’t worry, our products are produced under strict USDA and FDA regulations in Iowa and Ohio. Knowing WINPRO is full of blood proteins rich in immunoglobulin gives me assurance that the products are wholesome, safe and work. I’m a believer in WINPRO and the amazing science behind it. The origin of the benefits of blood protein goes back to the1980s. At Iowa State University, researchers discovered and declared that spray dried plasma is an effective alternative to antibiotics for piglets. This opened up the door for further research and discovery, including successes with other farm animals. As this spray dried plasma is 100% natural and was proving successful, a formula entered the performance horse market in 2013. Dubbed “a performance revolution,” the successes seen in this realm were undeniable. In 2016 WINPRO founder Bill Bernardo, having experienced the power of the proteins first-hand in performance horses, developed the first-ever blood proteins supplements made especially for dogs. Our WINPRO pet supplements are designed to target the five most common problems your dog is most likely to face. Experience the wonder of WINPRO for yourself by taking the 20-day challenge with your pet! Simply purchase the trial pack of any of our products and start seeing results in as little as two days. 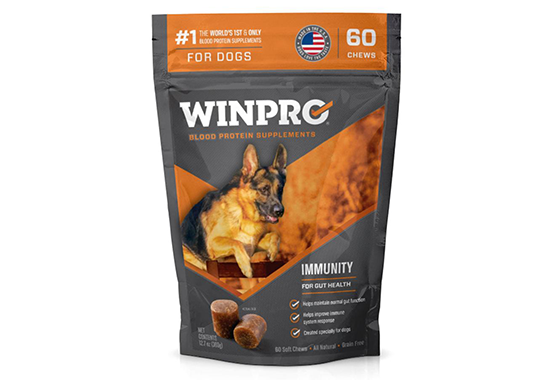 WINPRO IMMUNITY contains a blend of animal blood proteins and other key ingredients to help dogs combat the negative effects of stress and inflammation. WINPRO Immunity is specifically formulated to help boost your dog's defense against things that can undermine its immune system. By promoting a healthy gut, WINPRO Immunity helps dogs of all ages —especially during times of travel, stress, competition, etc.